Vinča: Laboratory for material science "Vinča"
The policy of Plasma Jet for constant R&D and its aim to "achieve always better" requires appropriate technical and manpower resources, which this laboratory possesses. Besides equipment for characterization of materials, the laboratory has ovens for most modern technologies of casting and thermal treatments. 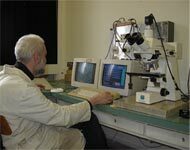 The laboratory is active in the area of ceramics materials, specific metal alloys, as well as in carbon materials and composites.